Currently I am staying in the Netherlands but I need to go back to my country (Spain) once a month from now on for some years. Each time I only need to stay one day, and the flight dates are flexible, the only constraint is that I have to do it once a month approximately. If I just book the flights as one would normally do, it is going to be quite expensive. I need ideas. What would you do? Do you know if some airline has some kind of membership that allows to book many flights so that price per flight is cheaper than buying them individually? There is no truly practical discount card for regular flights in Europe that I am aware of. You are looking to fly often and this comes at a price. That being said, there is a number of tweaks where you can optimize. First I suggest you get a very good understanding of which connections are practical in getting you from where you are in the Netherlands to where you need to be in Spain (I assume a pair of cities). Rome2Rio is great at this, but also Kiwi. With Rome2Rio it already gives you the non-flight transport options (but you have no way to specify dates), whereas for Kiwi the dates can be set (quite freely so) but you have to figure out about getting to the airport yourself. Try to avoid flying on busy dates, i.e. major holidays (Christmas, Easter, ...) or other events (trade fairs, conventions, conferences, ...) if you can and unless you intended to travel on these occasions in any case. If your likely itinerary is on a traditional carrier (e.g. KLM or Iberia, as opposed to low-cost), they likely charge more for one-ways and returns with a short stay (less than 2-3 days or a weekend day typically). A way around this is to nest your flights: have two bookings such that the return of the first booking is actually a month later, while the return of your first trip is with a different booking. Also the origin can make a difference, so it might be better to have most bookings originate from Spain or the Netherlands. Collecting miles with the frequent flier program of the airline might give you a free flight every once in a while, but cost-wise you are much better off booking cheap and getting less miles. Subscribe to blogs on cheap airfare and company newsletters to be aware of sales periods and offers. Especially Ryanair often has good discounts this way. Timing is crucial as well: not too late and not too far ahead. You will need to build some experience yourself on this. My rule of thumb is that if I know my dates and I see a good fare, then I do take it. Savings can also be had by booking through the right channel (airline website vs. flight search sites vs. brick and mortar travel agents) and often means of payment (bank debit vs. debit cards vs. ...). For flights within Europe the website of the operating airline is typically my first guess. Sometimes flight search engines do offer discount codes. If all of this is too complex for you even after some own research and trying, go for a good travel agent. It lets you find the absolute cheapest dates to book the flights, with a very wide range visible at once. It also supports Europe's low cost airlines, so you wouldn't miss out on the cheapest offers. I am more familiar with North America, but my method should work in Europe as well. Each morning, when you turn on your computer to start your work day, the first thing to do is perform a flight search for ever flight you plan to take in the next 8 months. I save the searches so I can perform them with a single click. Over time, you will get a good idea of what a good deal is, and when the flights are cheap, buy immediately. In theory, any online flight search tool will work for this. In the US, the most versatile tool in my opinion is Flight Matrix which is run by google, and provides the back end data for all other flight search tools, like travelocity or Kayak. 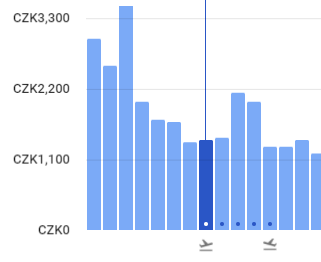 The benefit of flight matrix is that you can do a "calendar of lowest fares" search, and set the # of days to stay as you wish, perhaps 1-3 depending on whether you must return on the same day, or should stay over night. It can tell you what day is the cheapest. So just set up 6 to 8 searches, do them everyday, and when a sale starts, buy right away. There is a caveat: Some airlines (Southwest Airlines, for example) are not in this system and must be search separately. Most airlines have a loyalty program (a.k.a. "frequent-flyer program") where you earn points from flights you take and those points can eventually be used to book free bonus flights. Effectively you can end up with "every tenth flight is free" for some value of 10, though predicting exactly how many flights you need to take to qualify for one similar bonus trip can take a lot of prior research. The downside (and the reason airlines do this) is that you need to make all your trips with the same airline (or at least the same alliance), so you will be less able to take advantage of better offers from other airlines, lest you end up with points in different loyalty programs that you can't combine into a flight. Apart from this, there's not much you can do, other than book your trips well in advance before the cheap seats sell out. It used to be that you could save significant money by buying a series of "back-to-back" Spain-Netherlands-Spain round trips with a stay of one month each, rather than a series of short Netherlands-Spain-Netherlands trips. However, pricing strategies that reward longer stays in this way have become less common. It is still worth looking into. Also remember that flights with a connection can be significantly cheaper than direct flights, so don't limit your search to airlines that fly directly between your destinations -- unless, of course, the time saving of direct flight is important enough to you that you're prepared to pay a premium for it. If your location and/or your date is flexible, there are a lot of tools that have been mentioned in posts here. Rome@Rio does not give you all the options, and its prices are more wild guesses. Kiwi will often NOT tell you as low a price as other tools, but at least its quotes are close. Kiwi and Matrix will let you search a whole month instead of Kayak’s seven days or Matrix’s five. Skyscanner makes a wild guess, then shows you a calendar with different guesses, and only when you pick a date, gives you a real price (but not necessarily the cheapest). Adioso and Momondo and Hipmunk are worth checking, but often don’t give the lowest. On and on and on. When you were posting this, did you look at the suggestions and similar questions? If not, start (but don’t post) a question on cheap/low cost flights and copy the links in all the related questions. Do you have to fly? It’s probably cheaper than train or bus, but I wonder whether a rail pass would work for something like this. Some years ago, I had to fly every six weeks, with Air France. My travel agency found out that AF had special discounts for flights booked 42 days or more in advance. Which, conveniently, was my timeframe. I'm not sure whether they still have that (since they acquired KLM, both airlines have the same discounts, generally, and commercial policies have been mostly based on AF's rather than KLM's), and whether 42 days would work for you, but it might be worth enquiring. Also, while AF is an airline with pretty bad service overall, their mileage program is quite generous, and membership level thresholds are lower for members outside France, which makes accruing mileage faster (as bonus mileage goes up with the membership mileage). So accruing mileage with AF/KLM might be an option. A number of airlines offer commuter passes for regular commuters. These are essentially blocks of ten or twenty undated tickets, purchased at a fixed price in advance. Later, when you wish to travel, you can use one of your tickets on any flight. You still have to make a booking several days in advance. You are often booked in the top booking class, so you can book any flight that has empty seats. They may or may not represent a discount over buying your flights one at a time. If you are flexible about your travel dates and airline, it probably does not. If you demand flexibility on your tickets, they may represent a considerable saving. I understand that OptionTown sells KLM flight bundles. I have heard broadly positive reviews on OptionTown from BA commuters, but I have not heard anything about their KLM tickets. Other travel agents may also be able to sell these tickets. What research have you done yet? I poked in a random date in January and got non-stop round trip tickets between AMS and Madrid for as little as $111 on Air Europa. Iberia offers at $125. In June Iberia was $114 and Air Europa was $150. What's your target price? I don't think you can get this any cheaper than that. If you book with enough lead time, you should be easily be able to find fares in this price range since it's served by multiple budget carrier. Also "Netherlands" and "Spain" are pretty unspecific. You also need to factor in cost of transport to the airport and, if applicable, accommodation. So there is more to optimize than just the air fare. KLM now offers what they call "flight bundles", which allow you to prebuy a number of undated tickets for the same passenger and city pair within Europe and set the dates as needed when needed (with some restrictions no doubt). I've heard of some US airlines having similar deals in the past, not of any in Europe (though they may exist). Not the answer you're looking for? Browse other questions tagged air-travel budget bookings eu or ask your own question.